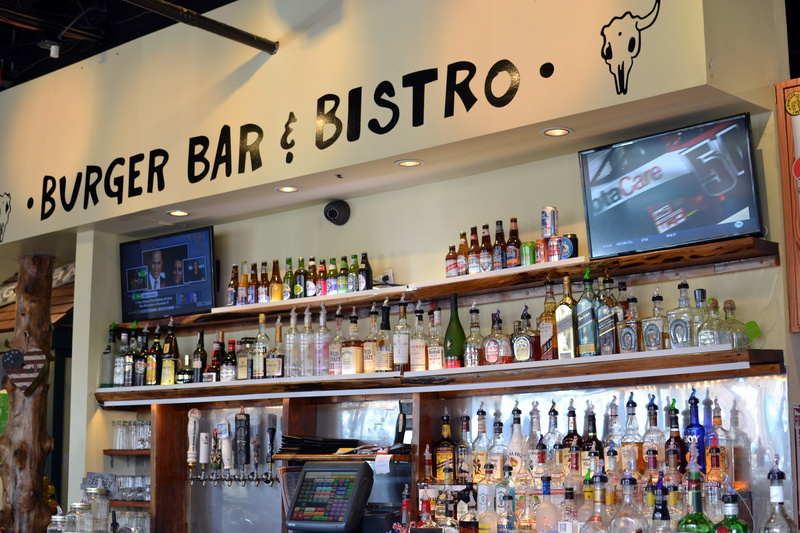 Burger Bar & Bistro is located across the alley from the SONO theater multiplex on North Main Street. Parking is very convenient behind the theatre and BBB offers bar service, a dining room, plus outdoor seating. On one of the first colder days of the year I went for a burger, since others have told me they were excellent. 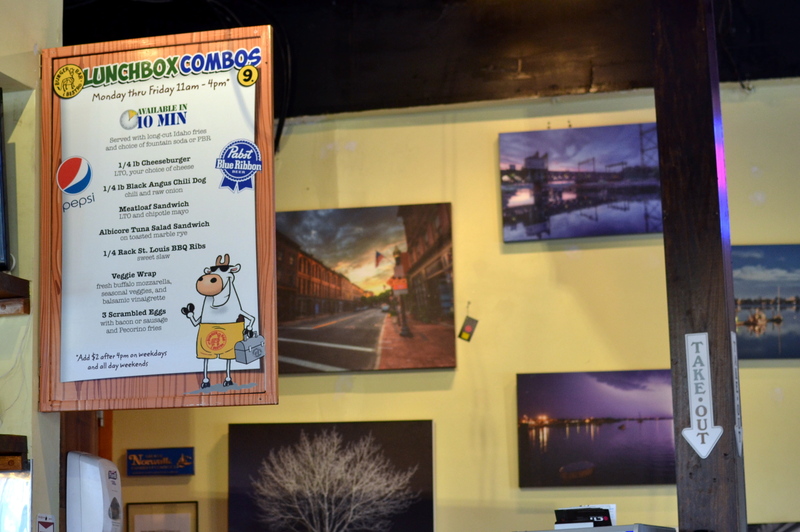 Each weekday from 11-4 BBB offers “$9 Lunchbox combos” each available in 10 minutes. 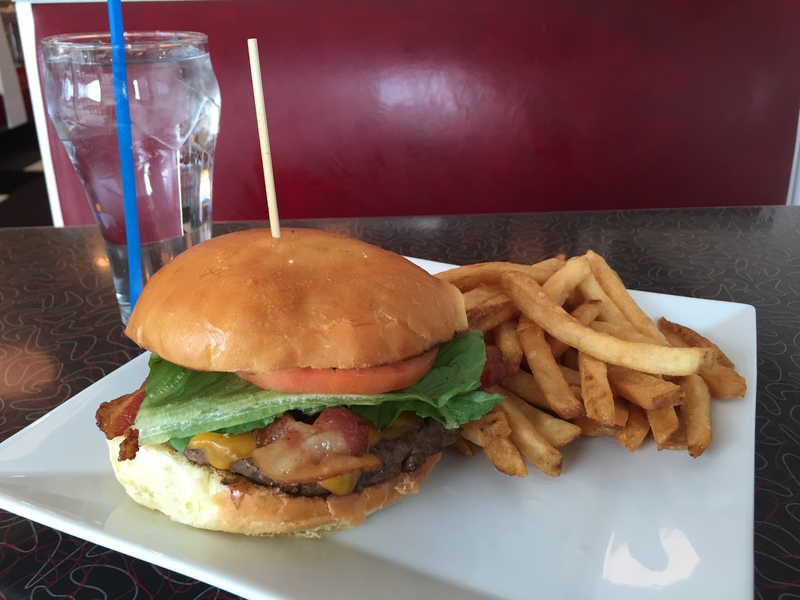 Choices include a ¼-pound cheeseburger; a chili dog; a meatloaf sandwich; a tuna salad sandwich; a ¼-rack of ribs; a veggie wrap or 3 scrambled eggs, each served with fries and a choice of a soda or a PBR. Given my experience, this 10-minute guarantee is a must option. I ordered my traditional bacon cheeseburger, medium-rare and a side of fries. I sat on one of the high top tables in the bar with my back to the window and I would recommend bringing a sweater or jacket as the windows are not the most efficient and it was quite cold. After a 20-minute wait my burger finally arrived. In addition to the burger and fries the plate included a mound of chipotle chips and a pickle wedge. 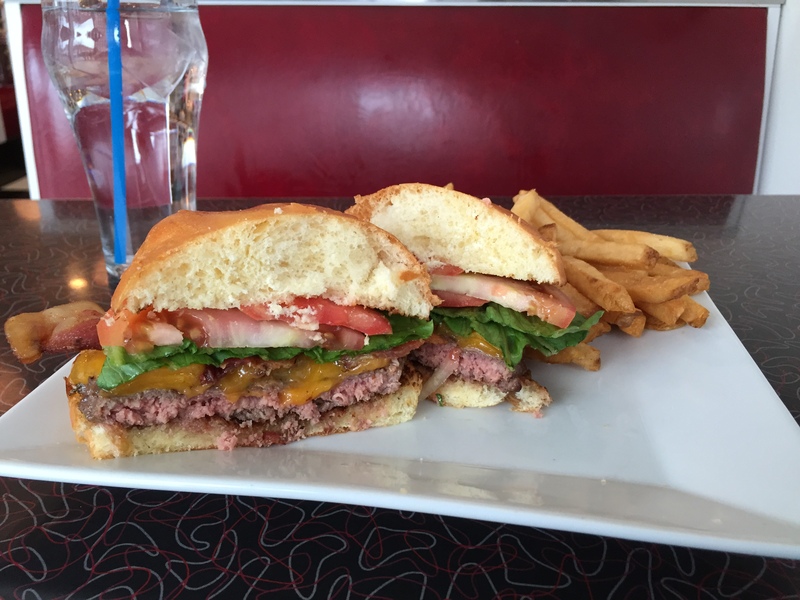 I cut the burger in half and understood why the wait was so long…it was cooked beyond well-done and must have been on the griddle for the entire 20 minutes. I called the hostess over, showed her the burger and told her I did not have another 20 minutes to wait. She said she would take care of it. A few minutes later the server approached the table and told me that he thought I ordered it medium-well. I also told him I did not have 20 minutes to wait for another burger. Ten minutes passed…nothing. The bartender approached and told me “it is almost ready.” I told him that if was not at the table in 2 minutes I would have to leave. Five minutes later, I started to put on my coat and the hostess saw me and mouthed, “it is almost ready.” I could not wait any longer. As I was approaching the front door to exit the bartender raced out of the kitchen with a brown bag and handed me a bag that contained a Styrofoam clam-shell. His parting words after handing me the bag, “We are not charging you for this.” I reached into the bag and opened the Styrofoam container…it contained a cheeseburger, no bacon, no fries…no thanks. Things happen and when they occur you try to correct them and be honest with the customer. By continually telling me it was almost done, it gave false expectations, and in the end, the bartender’s dismissive attitude was the last straw. 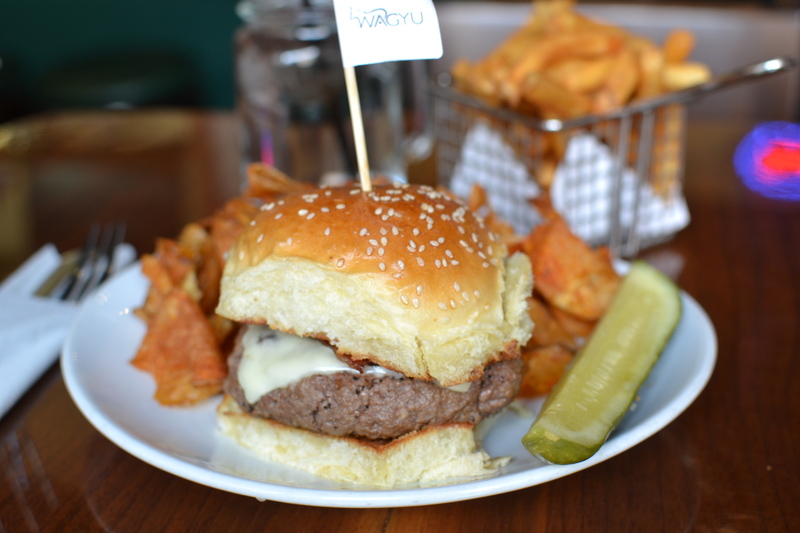 Burger Bar and Bistro is now on my Do Not Return list…there are too many options in the area to return. My second visit to JAX started with more confusion. As much as I convinced myself at the end of my first visit that the next sandwich would be “The Che,” “The Chicken and Waffle” or “The Spread” when I stared at the chalkboard I wanted everything. I was finally pulled to the register by the “Smoked Pulled Pork” and ordered. The menu described this sandwich as 16hr pork, high brow slaw, house Q, topped with Alton Brown’s Koolickles (Dill pickles brined in Kool-Aid) on a Portuguese roll. As I waited, I ogled at OPF (that’s “Other People’s Food”) and saw a variety of sandwiches that I absolutely needed to try on subsequent visits. Each was large, well-constructed and looked absolutely delicious. My Pulled Pork arrived and it was the same size as my Cuban from the first visit, and almost looked like its twin sibling. The slow-cooked pork…it was outstanding, overly tender; rich in flavor and could easily stand on its own as a platter. 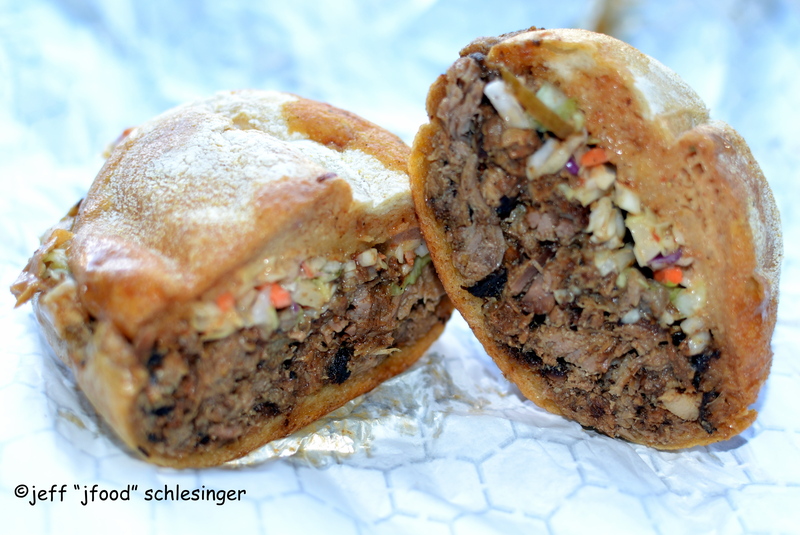 The other ingredients elevated the pork…the slaw delivered just a touch of background tartness, the sauce added and increased level of spiciness and then the Koolickles kicked in with an interesting grouping of sweet-sour. All of this deliciousness was encased in a wonderful roll. The combination delivered a perfect balance of smoky, sweet, spicy, sour, savory…absolutely wonderful. I cannot wait to return to JAX. For the next few visits I will continue to work my way through more sandwiches…is “The Che,” “The Chicken and Waffle” or “The Spread” up next? It’s a tough decision. 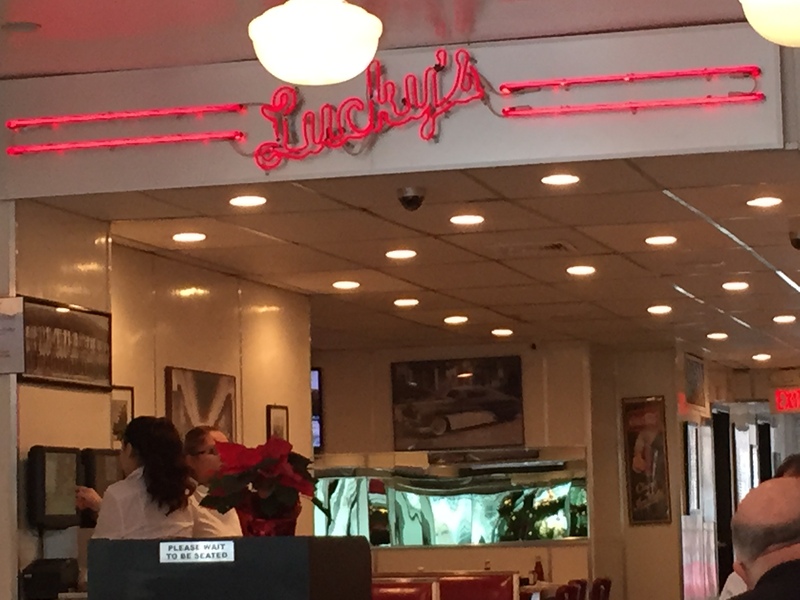 Lucky’s Classic Burger & Malt Shop is a throwback to the days of Frankie and Annette, Lost in Space and Ed Sullivan. The interior offers ten large booths, four smaller booths, tables & chairs plus ten stools at the counter. The table tops are made of black Formica with mini rubber band design, each table has a juke box with nickel-tunes (selection range from Chubby Checker to Journey). Black and white photos from the 50’s and 60’s adorn the walls. The only thing missing are poodle skirts, leather jackets and slicked back hair. This restaurant is a time machine to simpler times when a burger and milkshake were the definition of a cool Friday night. I ordered a bacon cheeseburger with fries and when the server (that would be a car hop) asked me how I would like my burger prepared I was impressed and ordered it medium rare. As I waited for the burger the server arrived with a canister containing unwrapped blue straws. Well, times have changed and it is flu season, so I passed on the straw. The burger and fries arrived and it was a good sized burger and a large mound of fries. My bacon cheeseburger was also topped with lettuce and tomato. I cut the burger in half and it was actually cooked to medium rare. Nicely done. I then tasted one of the fries. They were basic frozen fries out of a plastic bag. They had a processed flavor to them, but were well salted. The first bite of the burger was disappointing. The meat was very ordinary, the patty was tightly compressed and not very tasty. The Cheddar cheese was well melted, somewhat tasteless as well and the bacon added the third leg to the flavorless stool. The tomato was even worse…it was less than supermarket quality and never should have left the kitchen. I understand that Lucky’s is a diner, but the price of the bacon cheeseburger and fries was over $13 with tax and tip. For that price I expect something better than a burger served at a Sunday fair. Gates opened its doors thirty-five years ago and continues to offer an array of dishes that keep this “elder statesman” on New Canaan’s Restaurant Row bustling seven days a week. 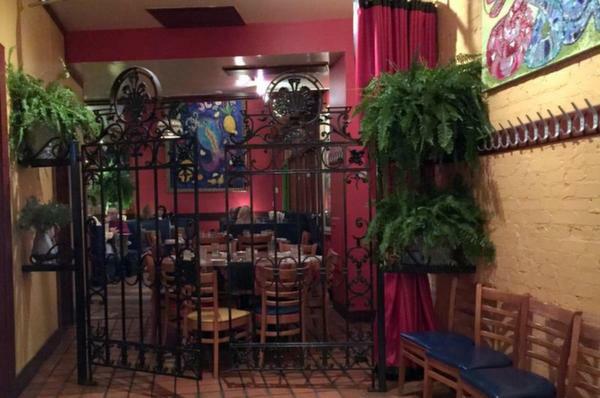 The entrance is guarded by ornate gates and once you enter you are immersed into a large, open dining area with walls adorned by murals by Janet Picard, paintings and large terra cotta planters. Wander to the left and you enter the bar with a long oak bar with 12 seats and several booths. Both areas are normally filled with locals partaking of a drink after work, families enjoying dinner and regulars having a good time with friends. The menu includes many local favorites, but I normally focus on a the sandwiches (the Bellagio is my favorite) and the burgers. Choose from the Gates Burger with avocado, bacon and Jalapeño jack cheese, a Bacon Cheeseburger, or the recently added Gruyere Burger, which includes bacon, Gruyere cheese and onion rings. Fries are standard or substitute for onion rings or sweet potato fries for a nominal $1.50 (I always order the sweet potato fries). I normally order a Bacon Cheeseburger with American cheese. 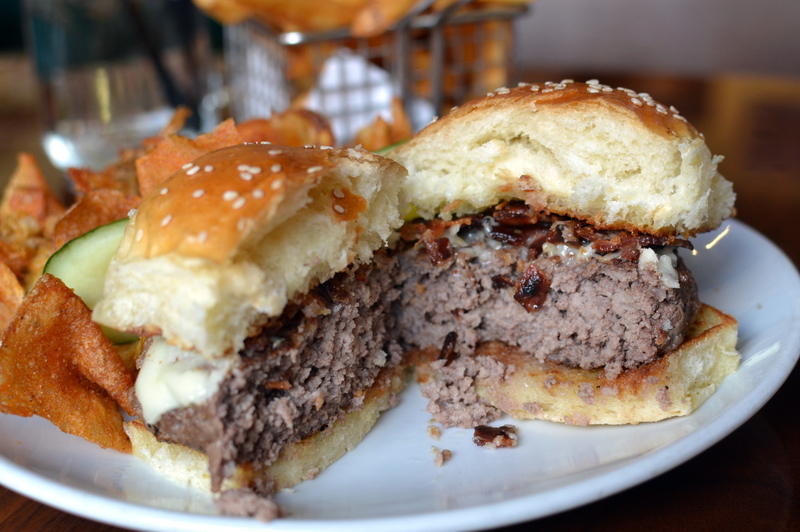 The meat is delicious and the combination of Gate’s bacon, cheese and bun is almost a friendly reminder that a good bar is, well, a good bar burger. On my last visit I went a little off-script and chose the Gruyere Burger, medium-rare. When the burger arrived I was a little surprised. I thought the “onion rings” from the menu were a substitute for the fries, but these were “frizzled” onions sitting atop the patty. Sitting on the other half of the bun was a slice of tomato and lettuce. The regular fries completed the dish. After assembling the burger I cut in in half…it was perfectly cooked to medium rare. The beef was flavorful and the grind of the meat was still present. The melted Gruyere was good and the bacon was mild and crispy, both adding a bit of saltiness. The crispy onions were an unwelcome addition, they overpowered the other items. The grilled bun added a little sweetness. I removed the onions for the second half. 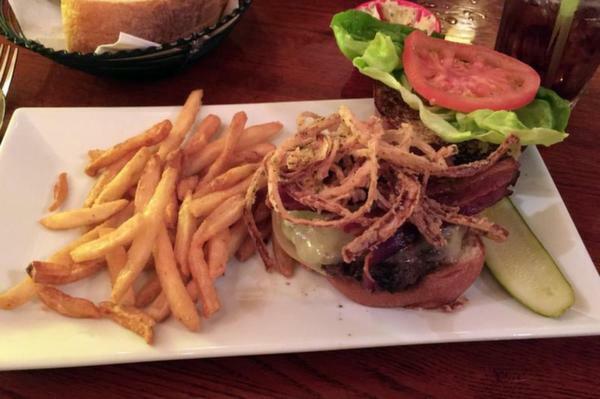 The combination without the onions was much better…this was now a really good bar burger. The fries were good, if I knew they were included I would have substituted for the sweet potato fries, which are some of the best in the area. On my next visit I will probably return to my normal Bacon-cheeseburger. In the end the only item I changed was the cheese, from American to Gruyere. As much as the Gruyere added a little nuttiness, my regular Bacon-cheeseburger with American cheese is still my favorite and maybe it will grab a slot on my next Best of Bar Burgers list. 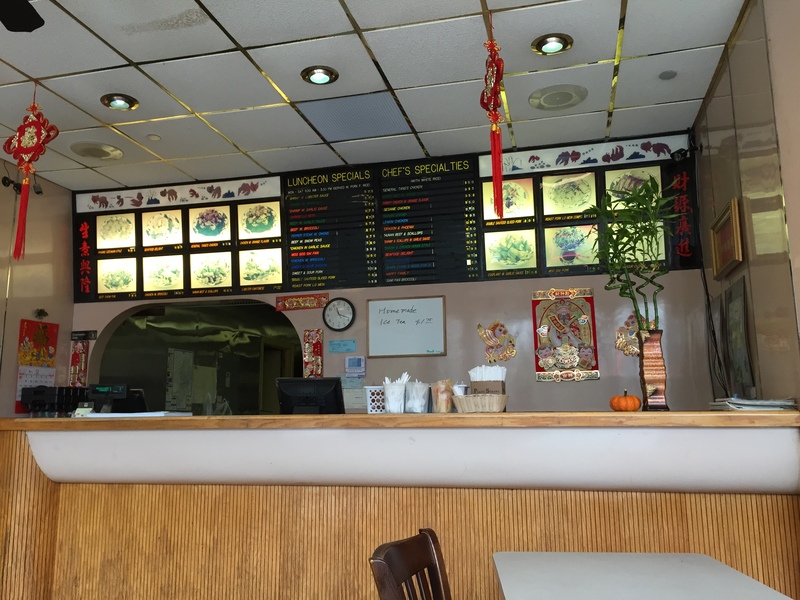 Chiu FAI Garden (Norwalk) – Alternative to a Sandwich? There are times when having another sandwich for lunch at the office is just not what you are in the mood for. 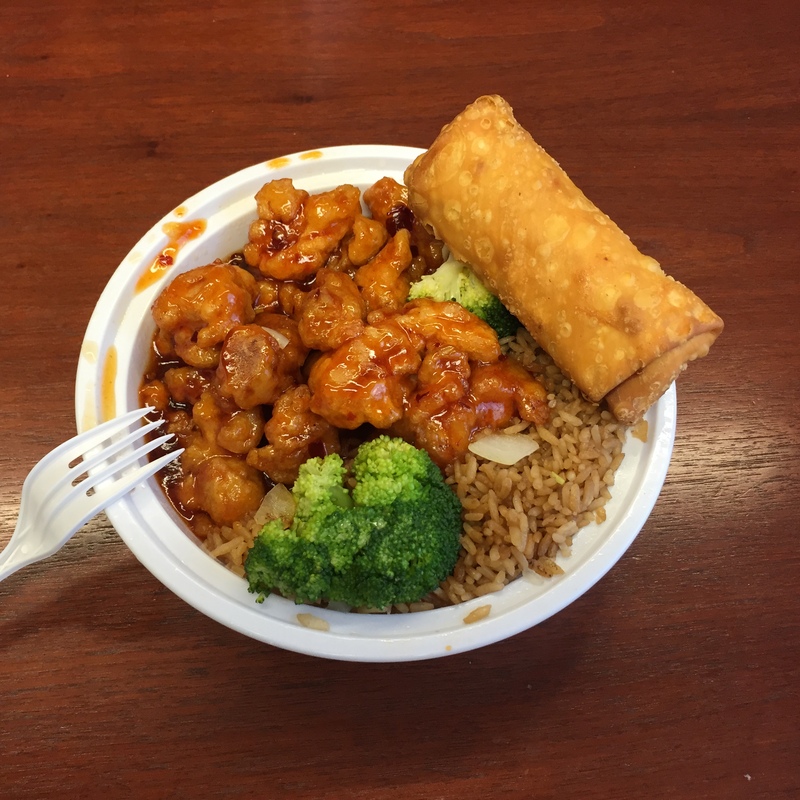 Maybe look for some pizza, or hamburgers or a to-go platter…Chinese take-out is always an option. There are very few options in the area. I’ve constantly driven by the multi-colored sign for Chiu FAI Garden near Stew Leonards and I tucked it away for future reference. Today, I finally made the journey for one of its lunch specials. For ~$6 it is the same price as a sandwich and I was in the mood for something different. The interior is standard NYC-style Chinese take-out. The rear of the building is the kitchen with several cooking stations, there is the obligatory picture menu (faded by the sun) above the ordering counter and there are tables and chairs for 16 people while either waiting or eating. I am not sure dining in is the best choice as the space is very sterile…this is definitely a grab and go. The menu is extensive, with Cantonese, Hunan and Szechuan choices. What caught my eye was the number of Lunch Special offerings…33 in all, ranging between $5-$6 and includes a choice of an entrée, rice and either a soup or an egg roll. I chose the General Tso’s Chicken, fried rice and an egg roll. The egg roll was medium sized. It had a good, thick crust, crispy and the interior was all vegetables. It was a good basic lunch egg roll. The General Tso combination platter was quite large for the price. It contained a good heaping of chicken, an equal amount of fried rice and two broccoli florets. The chicken was fried very well…the exterior was crispy and the chicken was cooked through without being over-cooked. Unfortunately the coating was very thick and you could barely taste the chicken, which was moist and tender. The pungent sauce delivered a lot of flavor, was sweet, maybe a touch too sweet, and was less than medium spiciness; do not be scared by the pepper icon on the menu. The fried rice contained a teeny smattering of roasted pork and onions, was very bland, but was good to coat the sauced chicken piece. Overall it was a good $6 lunch. 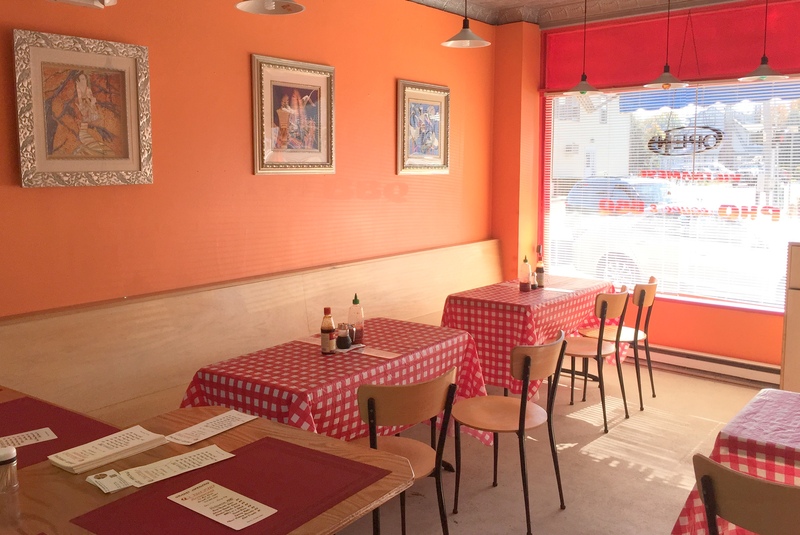 Is this a go-to Americanized Chinese take-out restaurant? I would not recommend for dinner at home but for a quick lunch that does not include a sandwich, Chiu FAI Garden is an OK option. Q’s Viet-Pho restaurant opened recently in the former location of Valencia’s on Main Street in Norwalk and after reading the review at CTbites I decided to try the Pho. The interior of the restaurant is very utilitarian. 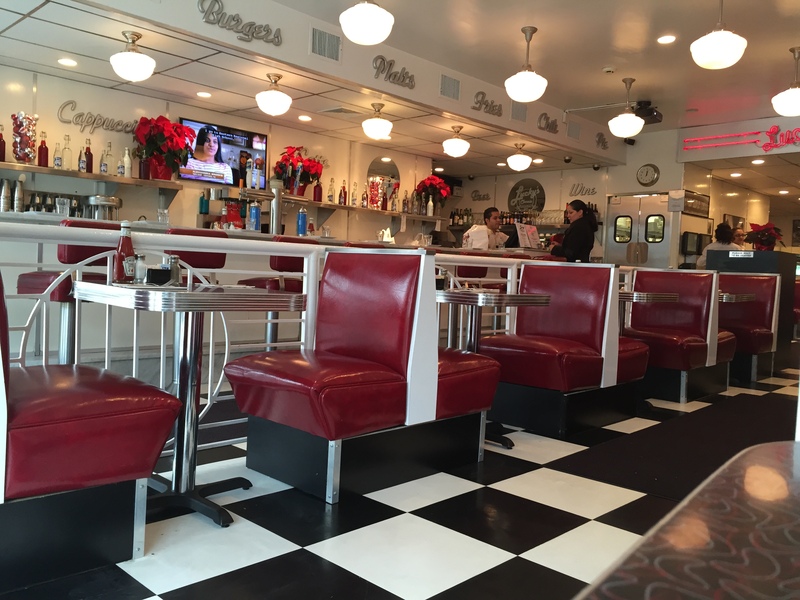 With 7 red topped diner-like bar stools and four tables that seat four, covered in red-checked plastic picnic table coverings, the interior is the backdrop to enjoy the food, not a destination décor. 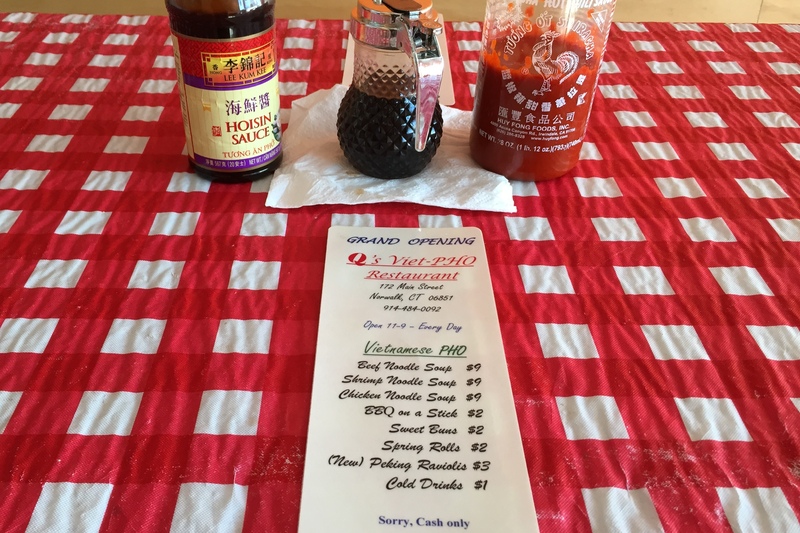 Bottles of Hoisin and Sriracha sauce sit on each table. The menu is very limited, beef, chicken or shrimp Pho (each priced at $9), BBQ on a Stick, Sweet Buns or Spring Rolls (each $2) or Peking Raviolis ($3). I ordered the beef pho and a spring roll to go. While I waited I chatted with the husband. He was Marine in Viet Nam 40 years ago, fell in love with the food. His wife is from southern China and has always yearned to own a restaurant. They decided to “give it a shot” and start with a small menu. The pho was packed in two containers. The soup with the noodles in a large plastic container and the other ingredients in a paper “Chinese Take Out” container. When I returned to my office I opened the latter and it contained carrots, cucumbers, cilantro, raw onions, lime wedges and thinly sliced beef (not raw but slightly cooked). I added all but the onions to the broth and allowed them to simmer. While the vegetables and beef simmered I tried the spring roll. It was about four inches long, thin and fried to a golden brown, more Chinese than Vietnamese. It was delicious with a sweet interior and an exterior that reminded me of fried phyllo versus thick Chinese exterior. I wish I would have ordered two versus one. I tasted the Pho and it was full of deep, multilayered flavors, great umami notes. The noodles were perfectly cooked, soft with a bit of bite and the meat was flavorful. The cilantro added fantastic flavor and was the perfect complement to the other deep flavors. Overall the food at Q was delicious. I will definitely return to try the other Pho options. When we moved to CT in the 90’s one of my concerns was where would I find my fix of bagels, smoked fish, deli, hot dogs, all the great food of my days in NJ. Disappointment after disappointment greeted me in CT…until I visited Liz Sue Bagels in Stamford. I was a bit of a bagel snob and limited my selection to plain, egg, sesame and poppy, maybe when I wanted to cross to the wild side I would order a cinnamon raisin or an everything bagel. Each of these options was very good at Liza Sue, I cannot call it a great bagel.Then one day I decided to order an oat bran. What I tasted was a delicious bagel, with a slightly different texture plus just a touch of sweetness. All of these flavors were elevated with a little toasting and I was soon a convert to expanding my bagel flavor choices. The bagel landscape in Fairfield County is still meager, but at least there is one option in Stamford, Liza Sue. There are very few places that make good bagels in Fairfield County (you have extra fingers on one hand if you count them) and over the years Liz Sue has remained one of those few places.